Soybean soup is my vegetarian version of Vietnamese crab soup, called "súp cua chay". I use instant soy meal that I buy at the Korean market. 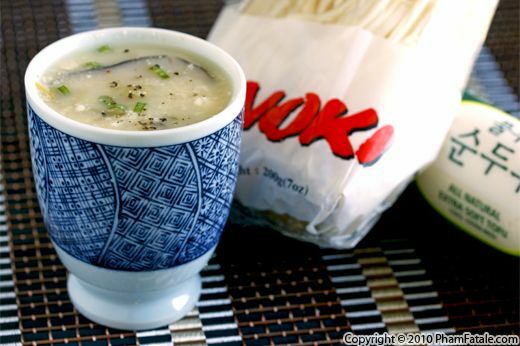 Once the soy meal mixture is cooked, the appearance of the soup is very similar to crab meat. In addition to the "fake crab", I add fresh gingko nuts, sautéed shiitake mushrooms and enoki mushrooms to give the soup a meaty texture. The soup is light and healthy, so I serve it often as a first course.